Although they may seem to be aimed at adrenaline junkies, rugged cameras also appeal to families who need a tough camera that can survive abuse in the hands of the younger members of the clan. As it can survive underwater down to 15m (49ft), endure drops from 2m (6.6ft) and cope with temperatures down as low as -10C (14F), Fuji's new XP200 seems ideally suited to both camps. Its buttons are a little larger than on previous models so they are better suited for used by gloved hands than before and it has chunky rubberised grips that make it feel pretty secure in your hand. We'll get back to you about the gloved hands bit when we get a full-production sample in – we want to see if you can operate them with wetsuit gloves. Although like other tough compact cameras there's no viewfinder, there is a 3-inch 920,000-dot LCD screen for composing images. Fuji has given this an anti-reflective coating so that it provides a clearer view in bright conditions, such as on the beach or in snow. We were only able to examine a pre-production sample of the Fuji XP200 indoors, but the screen seemed to be pretty good. We're looking forward to trying it in more challenging conditions. Most tough camera manufacturers have realised that a dual lock is required to avoid accidental opening of the battery and SD card compartment, however, these mechanisms can be quite fiddly to use. Fuji has integrated the two locks into a dial and button system - just press the central button and twist the dial to open it. We found it very easy to use while offering the security that you want. Fuji has also introduced a burst mode button, and pressing it automatically sets the camera to record full-resolution (16MP) images at 10fps for up to nine images. It seems an ideal solution for capturing action that develops quickly. 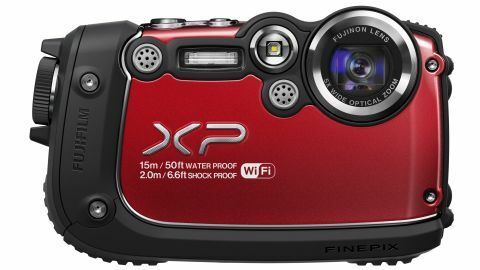 Like the Fuji XP170 before it, the Fuji XP200 has Wi-Fi connectivity built in. This enables image and video transfer to a PC or smartphone without the need for cable connections, which is handy when the camera is wet or covered in mud. We weren't able to test it in person, but Makoto Ooishi from Fuji's product planning division in Tokyo tells us that it's now quicker and easier to set up the Wi-Fi connection for the first time. The camera doesn't have a Near-Field Communications (NFC) chip built in, however. We have yet to shoot any images with the Fuji XP200, but its credentials are impressive and it seems that Fuji has thought about how and where people want to use a rugged camera.